The Sixth Assembly of Figures is a major example of the mature style arrived at in the 1960s. Unlike earlier paintings on the same theme, the forms of the figure and landscape are no longer clearly defined, slotted one into another, but merged into a tessellated fabric; an ambiguity is thus set up between the figure and ground, surface and illusionistic depth. This increased surface tension is combined with a subtle exploration of cool blues tending towards black, offset by warm tans and buffs. 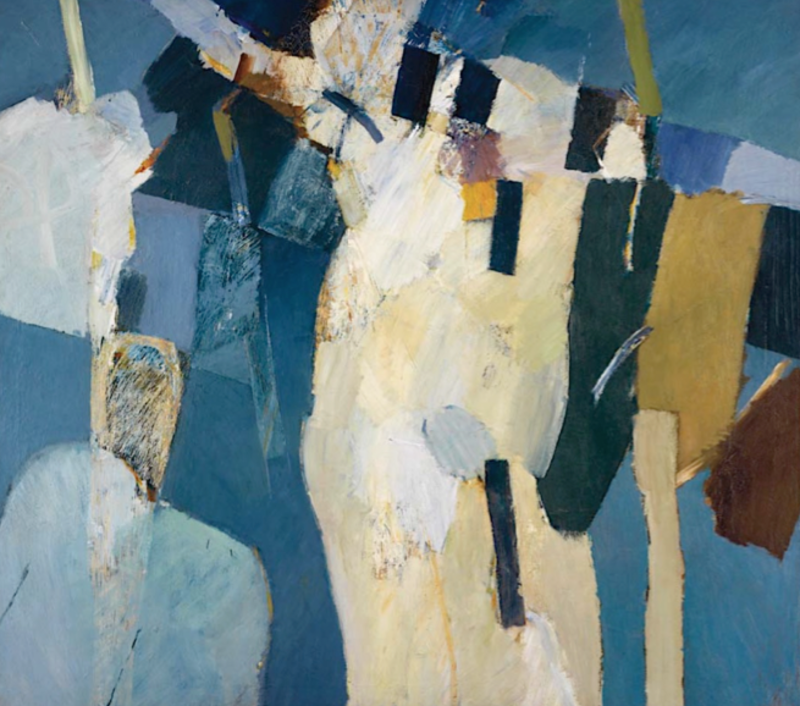 The painting hovers between figuration and pure abstraction: only the title and knowledge of the fundamental impulse behind Vaughan’s work reminds one of its human content. I want the best of myself for my work. I still think I have done nothing better that the August 4th Bather, 1961 – Ganymede  is perhaps as good and the large Assembly [no. 6]. Both these pictures I worked on continuously from Whitechapel until I went away – Since then it has been small reconnoitring panels. I am surprised to hear Marlborough have VIth Assembly. This was bought from me by a private collector in 1962. If Marlborough Fine art have it they must have bought it back or are going to resell it. There is an indeterminate number of figures contained within the quilt-like composition of the Sixth Assembly of Figures. Human presence is implied not only in the amorphous groups but also in the physicality of Vaughan’s sensuous application. It is one of his most eloquent and inventive paintings and the pigment is applied to the canvas in dense coats, transparent layers and dry-brush scrubbings. Areas have been scraped vigourously and scratched away with a sharp scalpel to reveal surprising textures and undercoats. Only the shape of a head and shoulders helps us determine the figure at the lower left. The tilted, cruciform configuration at the right may be a single figure or an interpenetration of two, merging into the surrounding landscape. Vaughan’s geometric blocks of colour, which advance and recede variously, add formal structure to the sensuous depiction of creamy, fleshy tissue.